We aimed to determine in the “THRACE” trial, the clinical and MRI technical parameters associated with the two-layered susceptibility vessel sign (TL-SVS) and the overestimation ratio (overR). 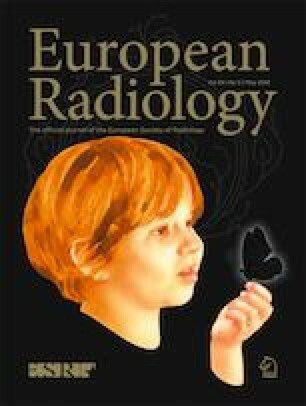 Patients with pre-treatment brain gradient echo (GRE) sequence and an etiological work-up were identified. Two readers reviewed TL-SVS, i.e., a SVS with a linear low-intense signal core surrounded by a higher intensity and measured the overR as the width of SVS divided by the width of the artery. Binomial and ordinal logistic regression respectively tested the association between TL-SVS and quartiles of overR with patient characteristics, cardioembolic stroke (CES), time from onset to imaging, and GRE sequence parameters (inter slice gap, slice thickness, echo time, flip angle, voxel size, and field strength). Among 258 included patients, 102 patients were examined by 3 Tesla MRI and 156 by 1.5 Tesla MRI. Intra- and inter-reader agreements for quartiles of overR and TL-SVS were good to excellent. The median overR was 1.59 (IQR, 1.30 to 1.86). TL-SVS was present in 101 patients (39.2%, 95%CI, 33.1 to 45.1%). In multivariate analysis, only CES was associated with overR quartiles (OR, 1.83; 95%CI, 1.11 to 2.99), and every 60 min increase from onset to MRI time was associated with TL-SVS (OR, 1.72; 95%CI, 1.10 to 2.67). MRI technical parameters were statistically associated with neither overR nor TL-SVS. Independent of GRE sequence parameters, an increased overR was associated to CES, while the TL-SVS is independently related to a longer time from onset to MRI. • An imaging biomarker would be useful to predict the etiology of stroke in order to adapt secondary prevention of stroke. • The two-layered susceptibility vessel sign and the overestimation ratio are paramagnetic effect derived markers that vary according to the MRI machines and sequence parameters. • Independent of sequence parameters, an increased overestimation ratio was associated to cardioembolic stroke, while the two-layered susceptibility vessel sign is independently related to a longer time from onset to MRI. Catherine Oppenheim and Olivier Naggara contributed equally to this work. The online version of this article ( https://doi.org/10.1007/s00330-018-5835-y) contains supplementary material, which is available to authorized users. This study was funded by the French Ministry for Health as part of its 2009 STIC program for the support of costly innovations (grant number 2009 A00753-54). The scientific guarantor of this publication is Hubert Desal, head of the Department of Neuroradiology, University Hospital of Nantes France. J. Labreuche from the Centre Hospitalier Regional Universitaire de Lille, Biostatistics, Lille, Hauts-de-France, France, kindly provided statistical advice for this manuscript. Before randomization, written informed consent was obtained from all patients or their legal representatives. The study protocol was approved by the Comité de Protection des Personnes III Nord Est Ethics Committee and the research boards of the participating centers. The trial steering committee attests to the integrity of the trial, the fidelity of this report to the study protocol, and the completeness and accuracy of the reported data.